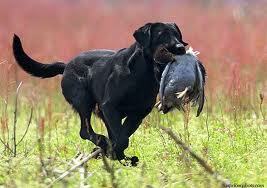 There are plenty of hunting dog accessories on the market today for cold weather. Boots, leggings, vests and warmers are all used to keep your hunting buddy safe, but the cold is really the least of your dog’s worries. The truth is that it is very difficult to freeze a working dog to death, but it can be quite easy to kill a dog by overheating it. 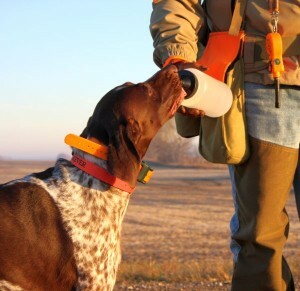 Even if the day is a mild day, hunting dogs can easily overheat and be put at risk, but if you keep close watch on your hunting dog, you can make sure that your days in the fields and woods are safe and fun. One of the biggest warning signs for a hot dog (haha see what I did there?) is an oversized tongue. If the dog is panting rapidly or more so than a normal workout and has a large cupped tongue, this can mean heat trouble. Another warning sign of dog heat stress is a bright pink or red tongue with large, clingy saliva. Take a break and get your dog out of the sun. A shade tree or cool pool of water is a good place to rest. Make sure that you get the dog some cool drinking water soon as well, so that it can get some hydration back into it’s system. A dog that is not steady on it’s feet or has glassy and unresponsive eyes is likely dehydrated. This sign of heat stress is very serious and could also be combined with vomiting or diarrhea. Get the dog into some cool water such as a pond or lake and continuously pour water over it. Once the body temperature has cooled, get him into an air-conditioned vehicle and transport him to a veterinarian immediately. If you can, make sure that you put ice on the dog under it’s belly or thighs to keep them cool. While you should know your dog’s normal skin temperature, you should make sure that you familiarize yourself with it before you go hunt. While hunting, periodically check this as well as the temperature. If your dog has a temperature over 104 degrees, they are in serious danger. Feel the dog occasionally to check the temperature, if you do check it and it’s high, get him to a vet immediately and pour cool water over the dog.